You know those recipes that immediately pop out at you, that you bookmark or pin on Pinterest and you just can’t forget? 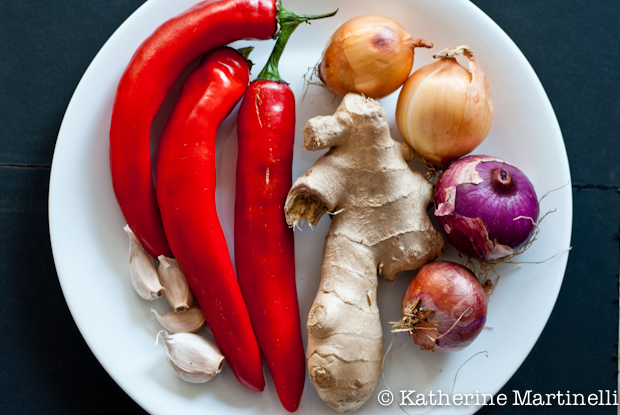 Beef Rendang – a Malaysian beef curry – was one such recipe for me. I pinned two different recipes for this tempting, coconut-infused beef curry on my Asian Inspiration board, each with a slightly different method and equally enticing result. It’s just that kind of dish. It had a similar effect on Manu of Manu’s Menu: “When I saw this recipe at Not Quite Nigella’s website,” she wrote in her post, “I knew I HAD to make it.” And so when I saw it over at Manu’s Menu and No Recipes, well, I also knew I HAD to make it.I must admit that mine is a bastardization. For one, I didn’t have galangal or kaffir lime leaves, two key ingredients. I took my favorite elements from each of the two recipes, like tamarind paste from Manu’s recipe and freeze dried coconut cream from No Recipes. I went with what I had, and I have to say that while slightly labor intensive, it was worth every second, every step, and every dirty dish that went into the process. It was one of the best things I’ve ever eaten. And be warned: the photos do not do it any justice. They’re pretty horrid in fact. This Beef Rendang is a beef stew like none you’ve ever tasted. The tender, slow cooked meat is enrobed in a thick, rich sauce of coconut milk, tamarind, ginger, garlic, turmeric and more. It’s one of the most beautiful flavor combinations I can imagine, and leaves you with serious cravings, even once you’ve wiped up every last drop from the pot. This beef curry recipe from Malaysia has a long ingredient list and cooking time, but don't be put off. It's worth every second. Mix together the salt, sugar, tamarind concentrate and water in a large bowl. Add the beef and toss to fully coat. Add the toasted coconut (reserve 2 tablespoons) and mix well. Set aside. Put all of the spice paste ingredients in a food processor and blend until you get a smooth paste. Heat the vegetable oil in a large, heavy-bottomed pan over medium heat. Cook the meat, working in batches, until seared on all sides. Transfer to a bowl. Add the spice paste and the rest of the curry sauce ingredients and cook for a few minutes. Add the coconut milk and bring to a simmer. Return the beef to the pan. Turn the heat to a low simmer, cover and allow to simmer for 2 hours or until the meat is fall-apart tender. Uncover, turn the heat to high, and boil for about 10 minutes, stirring often, until the sauce has reduced and thickened to desired consistency. If for any reason the blog hop code doesn’t show up below, click here to link up your favorite beef recipes! do you know Beef Rendang is one of the 50 most delicious dishes by a CNN survey? That’s why it’s difficult to resist 😀 don’t worry about the variation in recipe, there’s differences in Malaysian, Singaporean and Indonesian version. even different parts of the country produces different rendang.. Thanks for hosting another fun party Katherine! Denise @ We Like To Cook! Every week I look forward to receiving your email reminding me to pop over and see all the yummy dishes our friends are serving up! As always, thanks for hosting! Great job on this! This is one of those dishes on my “list” to make, and I love how you’ve done it. Great photo, too. Good stuff – thanks. ‘to-do-menu’ for next week – my husband will not let me forget it (lol). Your photography, as always, is an inspiration. Thank you. Definitely will be trying this, too. SO many raves can’t be wrong! Love this dish! And with winter coming it looks like the perfect dish for a comforting and warming dinner! Your recipe looks amazing Katherine! Thank you for another delicious blog hop. 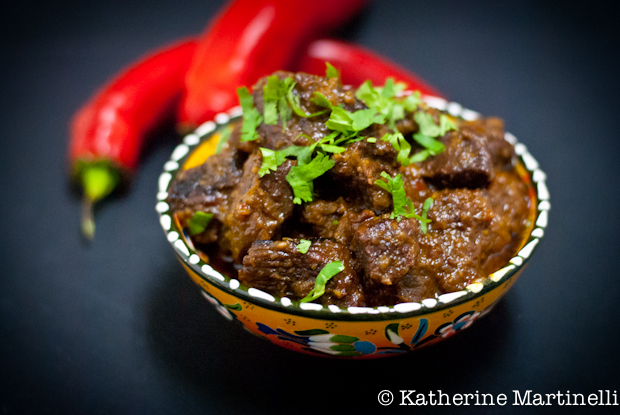 Your Beef Rendang looks incredibly flavorful and the photography is beautiful! This recipe sounds fantastic and is making me want to run out to the local Thai place for lunch! I do make some Asian inspired dishes at home but never seem to have all the right ingredients to make it taste like I want to. Great work here! Thanks so much for hosting every week! Have a great weekend!! I was already very tempted to make this then I saw Shannon’s comment and now I know I’ll be making beef rendang. Talk about a depth of flavors! I’ve linked up a West African beef stew that I discovered last fall and have made a couple of times since. Another great stew. Thanks for hosting this great hop! My contributions to your bloghop is a twisted beef pie that I think you should try and make it! Hugs and Kisses my friend, have a nice weekend! Something I naturally have prepared for at least three decades: have to compare recipes!! Wonderful basic 🙂 ! I love curry, this looks delish! You are making me homesick! I lived in Kuala Lumpur for more than eight years and this was one of my favorite treats. I have to admit that I have never made it since it was so easily available but I will definitely give it a try now. As always, thanks for the beef blog hop! I have shared my individual beef Wellington. This looks so incredible. I love Malaysian food, so much flavor. Spice pastes are so delicious. Oh the flavors! Looks and sounds mouthwatering! Katherine, this looks SO good! I just want to stick a spoon in that bowl. This is great Katherine. I am always excited when I see this flavor profile with Beef b/c it is uncommon. Great choice! This looks so easy and delicious. I don’t eat beef but I do get free range bison to cook with once in a while. I’m always looking for interesting dishes to try. This fits the bill! Cooked this today and am very disappointed. Potentially it could be nice but my dish turned out far far too rich and also too salty. Maybe less soy and salt might help, not sure. I’m so sorry to hear that Dave! It’s especially disappointing since it’s a bit of a time consuming dish to prepare. The richness is one of the things I enjoy about it, and beef rending usually, but that’s too bad that you found it too salty. There can be quite a lot of variation in the sodium levels of soy sauce, which could have attributed to yours being so salty and mine not. I also find that certain salts are saltier than others if that makes sense. Whatever the reason, I’m truly sorry you didn’t enjoy it! Hello, I would really like to make this dish, but in the first set of directions it says to mix the water in. I don’t see water listed anywhere in the ingredient list and so am not sure how much to put in? If you could add this detail, that would be great! Thanks. Eek! Good catch, thanks so much. I’d say about 2 tablespoons – just enough that everything forms a smooth consistency but not so much that it’s watery. Enjoy!! This is absolutely delicious. Thanks for sharing this recipe.